The Graph View pane is used to visualize the tracking data in Motive. This pane can be accessed from the command bar (View tab > Graph) or simply by clicking on the icon. This page provides instructions and tips on how to efficiently utilize the Graph View pane in Motive. Using the Graph View pane, you can visualize and monitor multiple data channels including 3D positions of reconstructed markers, 6 Degrees of Freedom (6 DoF) data of trackable assets, and signals from integrated external devices (e.g. force plates or NI-DAQ). Graph View pane offers a variety of graph layouts for the most effective data visualization. In addition to the basic layouts (channel, combined, gapped), custom layouts can also be created for monitoring specific data channels only. Up to 9 graphs can be plotted in each layout and up to two panes can be opened simultaneously in Motive. Graphs can be plotted in both Live and Edit mode. Graph Editor This opens up the sidebar for customizing a selected graph within a layout. Lock Cursor Centered Locks the timeline scrubber at the center of the view range. Delete Selected Keys Delete selected frame region. Move Selected Keys Translates trajectories in selected frame region. Select a range and drag up and down on a trajectory. Draw Keys Manual draw trajectory by clicking and dragging on a selected trajectory in the Editor. Merge Keys Up Merges two two trajectories together. This feature is useful when used with the Tracks View graphs. Select two trajectories and click this button to merge the top trajectory into the bottom trajectory. Merge Keys Down Merges two two trajectories together. This feature is useful when used with the Tracks View graphs. Select two trajectories and click this button to merge the bottom trajectory into the top trajectory. Lock Selection Locks the current selection (marker, rigid body, skeleton, force plates, or NI-DAQ) onto all graphs on the layout. They are used to temporarily hold the selections. Locked selections can later be fixed by taking a snapshot of the layout. This is elaborated more in the later section. Creates a new graph layout. Saves the changes to the graph layout XML file. Takes an XML snapshot of the current graph layout. Once a layout has been particularized, both the layout configuration and the item selection will be fixed and it can be exported and imported onto different sessions. Opens the layout XML file of the current graph layout for editing. Opens the file location of where the XML files for the graph layouts are stored. Zooming: Zoom quickly into the selected range by clicking on the button or by using the F hotkey. Tracking Data Export: Exporting tracking data for selected frame ranges. Reconstruction: Performing the post-processing reconstruction (Reconstructing / Reconstruct and Auto-labeling) pipeline on selected frame ranges. Labeling: Assigning marker labels, modifying marker labels, or running the auto-label pipeline on selected ranges only. Data Deleting: Deleting 3D data or marker labels on selected ranges. The layouts feature in the Graphs View pane allows users to organize and format graph(s) to their preference. The graph layout is selected under the drop-down menu located at top-right corner of the Graph View pane. In addition to default graph layouts (channels view, combined view, and tracks view) which have been migrated from the previous versions of Motive, custom layouts can also be created. With custom layouts, users can specify which data channels to plot on each graph, and up to 9 graphs can be configured on each layout. Furthermore, asset selections can be locked to labeled markers or assets. 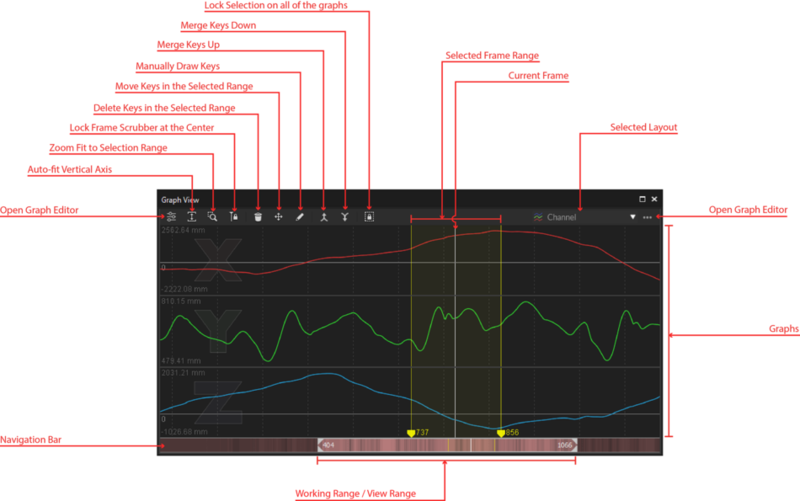 Layouts under the System Layouts category are the same graphs that existed in the old timeline editor. 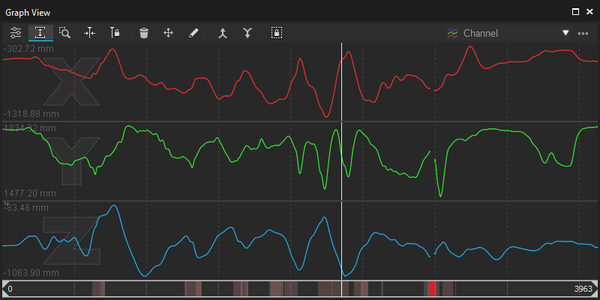 The Channel View provides X/Y/Z curves for each selected marker, providing verbose motion data that highlights gaps, spikes, or other types of noise in the data. The Combined View provides X/Y/Z curves for each selected markers at same plot. 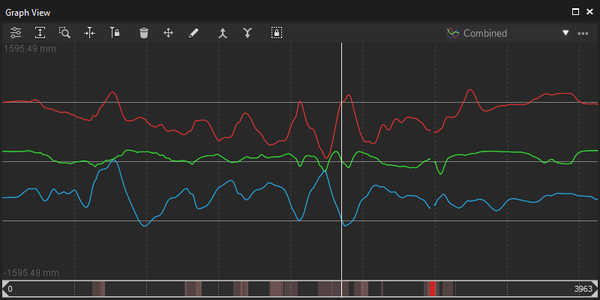 This mode is useful for monitoring positions changes without having to translate or rescale the y-axis of the graph. 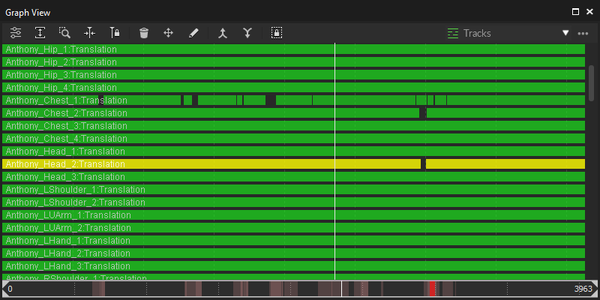 The Tracks View is a simplified view that can reveal gaps, marker swaps, and other basic labeling issues that can be quickly remedied by merging multiple marker trajectories together. You can select a specific group of markers from the drop down menu. When two markers are selected, labels can be merged by using and . In the new Graphs View pane, the graph layout can be customized to monitor data from channels involved in a capture. 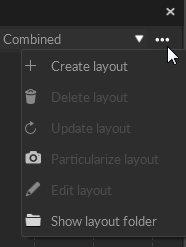 Create a new layout from the menu > Create New Layout option or right-click on the pane and click Create New Layout option. Graph layout customization is further explained on the later section: Customizing Layout. New layouts can be created by clicking on the Create Graph Layout from the pane menu located on the top-right corner. Data Editor in the Graph View pane. 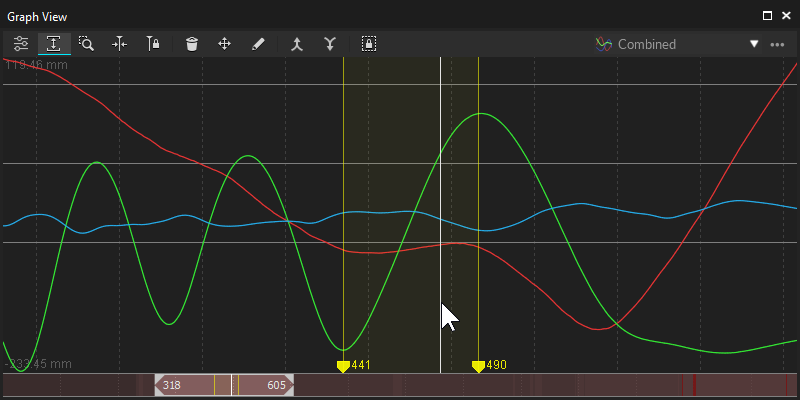 Expand the Graph Editor by clicking on the icon on the tool bar. Click on a graph from the grid. The graph will be highlighted in yellow. 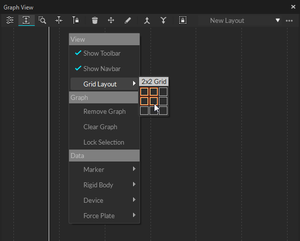 Within the grid, only the selected graph will be edited when making changes using the Graph Editor. Next, you need to pick data channels that you wish to plot. You can do this by checking the desired channels under the data tab while a graph is selected. Only the checked channels will be plotted on the selected graph. Here, you can also specify which color to use when plotting corresponding data channels. Then under the Visual tab, format the style of the graph. You can configure the graph axis, assign name for the graph, display values, and etc. Most importantly, configure the View Style to match desired graph format. When plotting live tracking data in the Live Mode, set the View Style to Live. 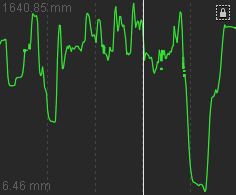 Frame scopr of the Live mode plots can be adjusted by changing the scope duration under application settings. Repeat the above steps 5 ~ 6 and configure each of the graphs in the layout. Select an asset (marker, rigid body, skeleton, force plate, or NI-DAQ channel) that you wish to monitor. The lock symbol indicates the selection has been locked on the graph. Lock selection for graphs that needs to be linked to the selection. Individual graphs can be locked from the context menu (right-clicking on the graph > Lock Selection) or all graphs can be locked by clicking on the toolbar. Once all related graphs are locked, move onto next selection and lock the corresponding graphs. When you have the layout configured with the locked selections you can save the configurations as well as the implicit selections temporarily to the layout. Until the layout is particularized onto the explicit selections, you will need to select the related items in Motive to plot the respective graphs. The last step is to make the selection explicit by particularizing the layout . You can do this by clicking the Particularize option under the pane menu once the layout is configured and desired selections are locked. This will fix the explicit selection onto the layout XML file, and the layout will always look for specific items with the same name from the Take. Particularized graphs will be indicated by at the top-right corner of the graph. It is important to particularize the customized layout once all of the graphs are configured. This action will save and explicitly fix the locked selections that the graphs are locked onto. Once the layouts have been particularized, you can re-open the same layout on different sessions and plot the data channels from the same subject with out locking the selection again. Specifically, the particularized layout will try to look for items (labeled marker, rigid body, skeleton, force plate, or analog channels) with the same names that the layout is particularized onto. The Graph Editor can be expanded by clicking on the Icon from the toolbar. When this sidebar is expanded, you can select individual graphs but other navigation controls will be disabled. Using the graph editor, you can select a graph, choose which data channels to plot, and format the overall look to suit your need. Only enabled, or checked, data channels will be plotted on the selected graph using the specified color. Once channels are enabled, an asset (marker, rigid body, skeleton, force plate, or DAQ channel) must be selected and locked. Plot 3D position (X/Y/Z) data of selected, or locked, marker(s) onto the selected graph. Plot pivot point position (X/Y/Z), rotation (pitch/yaw/roll), or mean error values of selected, or locked, rigid body asset(s) onto the selected graph. Plot analog data of selected analog channel(s) from a data acquisition (NI-DAQ) device onto the selected graph. Plot force and moment (X/Y/Z) of selected force plate(s). Plotted graph respects coordinate system of the force platforms (z-up). Using the black color (0,0,0) for the plots will set the graph color to the color of the rigid body asset shown in the 3D viewport; which is set under the rigid body properties. Channel: Plots selected channels onto the graph. Combined: Plots X/Y/Z curves for each selected markers fixed on the same plot. Gap: The Tracks View style allows you to easily monitor the occluded gaps on selected markers. Live: The Live mode is used for plotting the live data. Enables/disables range handles that are located at the bottom of the frame selection. Sets the height of the selected row in the layout. The height will be determined by a ratio to a sum of all stretch values: (row stretch value for the selected row)/(sum of row stretch values from all rows) * (size of the pane). Sets the width of the selected column in the layout. The width size will be determined by a ratio to a sum of all values: (column stretch value for the selected column)/(sum of column stretch values from all columns) * (size of the pane). Display current frame values for each data set. Display name of each ploted data set. Plots data from the primary selection only. The primary selection is the last item selected from Motive. Sets the size of the major grid lines, or tick marks, on the y-axis values. Sets the size of the minor grid lines, or tick marks, on the y-axis values. Sets the minimum value for the y-axis on the graph. Sets the maximum value for the y-axis on the graph. This page was last modified on 27 August 2018, at 10:28.